Platinum-certified rapper Derez De’Shon announced the release of his upcoming album “Pain 2” (Commission Music/BMG) with a new single “Whaddup Doe” featuring Sacramento rapper Mozzy. The track truly embodies the essence of modern-day rap as it brings together two of hip-hop’s hottest talents. Pain 2 is the follow-up to De’Shon’s highly-successful 2018 mixtape “Pain” which spawned the award-winning top 5 urban radio hit “Hardaway,” and has gained critical acclaim from the likes of Billboard, XXL, RESPECT and more. The official video for the classic street anthem has also impressively generated approximately 100 million video views to-date. Picking up where Pain left off, the theme of “Pain 2” is beating the odds (at all costs). As Derez continues to break through to the masses, he also learns how to deal with the harsh realities of growing pains. With undeniable beats and introspective lyrics, Pain 2 is a testimony of his triumphs and tribulations. Watch Derez De’Shon beat the odds with the release of “Pain 2” as he continues to rise as a dominating player in the game. Derez De’Shon is the epitome of what it means to “beat the odds,” despite facing many personal hardships. His determination to rise above his challenges through his music earned him a platinum certification for his top 5 urban radio hit single “Hardaway,” certified gold for “Fed Up” (featured as the trailer song for Equalizer 2) and more than 500-million streams and counting for his critically-acclaimed mixtape “Pain.” Derez’s impact only continues to skyrocket. The Atlanta-based rapper successfully coveted the prestigious “Social Star Award” at the 2018 BMI Awards in addition to making his television debut on Wild N Out and a live performance at the 2018 BET Music Awards “106 & Park” Special. 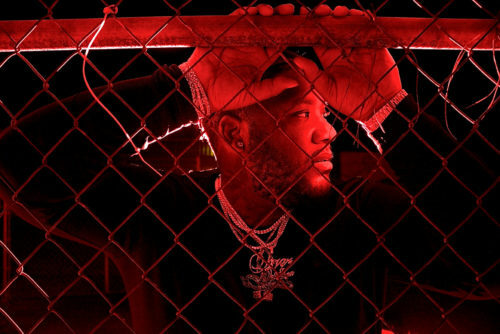 With “Pain 2” on the way, Derez De’Shon proves he’s here to stay!